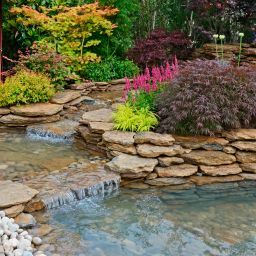 Are you looking for pool remodeling Atlanta residents use to reimagine tired poolscapes? Or are you considering new pool construction Atlanta residents crave in the warm Atlanta summers? No matter what your Atlanta, GA, pool preferences are, trust the pool builders Atlanta calls on again and again for new and remodeled pools – Atlanta Outdoor Designs. Here are three of the top Atlanta, GA, pool design trends for 2018. Just as homes have become “smarter” with everything from thermostats to garage openers that take on additional functionality, new pool construction Atlanta chooses is also leveraging technology in new ways. New applications allow for pool owners to automate functions in and around the pool. Downloading these apps on a smartphone or tablet and pool owners can control all kind of functions, from lighting to temperature to water features, with the touch of a few keys. These controls can also allow pool owners to activate the cleaning system or the pool cover from the comfort of a chaise lounge. Your pool builders Atlanta Outdoor Designs can help create a theme that envelops your pool area and the rest of your backyard landscape. One popular option this year is using tile mosaics to create bold patterns of polished materials in your pool’s interior. Darker colors are en vogue this year, creating a dramatic, lagoon-like effect for homeowners who choose that route. Textured pebbles and stones are also popular this year. Say it with tile patterns to create a seamless connection between your home and backyard, your pool area and other parts of your backyard, or within the pool area itself. Lighting is a big part of creating the ambiance within your pool theme. Pool LED lighting is a great way to add a splash of color and a new look to your pool area, especially at night. Landscape lighting can be used not just for safety considerations but also to highlight shrubs, bushes, and trees and create an outdoor oasis lit the way you want. The rectangular swimming pool of the past is no longer the only option. For new pools or pool remodeling Atlanta residents are getting creative in 2018. Same depth. 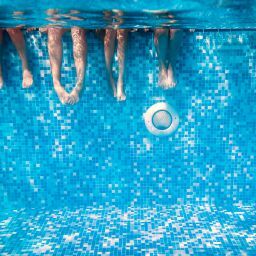 Some owners want a pool with the same depth from end to end, especially when used primarily for exercise, whether for laps or playing water basketball or volleyball. Hydrotherapy. In-pool jets can help ease sore muscles and recovery from injury. While jetted water is typical in smaller pools and spas, they can now be installed in larger pools, too. Saltwater. Saltwater pools use fewer chemicals, instead relying on salt in the water for part of the purification process. Deck jets. Like waterfalls and fountains, deck jets add motion and calm to your pool area while giving new swimmers a surprise! Sun shelves. Often called Baja shelves or tanning ledged, these features are flat and shallow areas built into the pool and idea for chairs or children to play on. Atlanta Outdoor Design has installed thousands of pools throughout the greater Atlanta area and is ready to help with your pool installation or remodeling needs. If you are looking for Pool Remodeling Atlanta, contact the experts at Atlanta Outdoor Design.